Have you been eagerly waiting for a smartphone manufacture to just go ahead and throw in a camera that is capable of recording in 4K? Well, here it is, Acer has just taken the curtains off its 6” phablet, the Liquid S2 with 4K recording capability, Full HD IPS display and is powered by a Snapdragon 800 processor. The Liquid S2 packs a 13MP BSI camera with LED ring flash and the ability to record 4K Ultra HD videos, making it the first phone to offer 4K recording functionality but of course, rumors has it that Samsung will also have something similar in its upcoming Galaxy Note III which will also be unveiled soon at Samsung Unpack 2013 event held simultaneously with IFA 2013. The camera also comes with Favorite Mode, allowing you to create up to five profiles with customized effects, flash, capture mode and scenes, fast Full HD video capture at 60fps, 4x slow motion and up to 27MP full panorama pictures. Other specs include a 2.2GHz Snapdragon 800 processor, 2MP front camera with 88-degree viewing angle, 4G LTE connectivity, NFC, Acer Float User Interface over Android 4.2.2, 2GB of RAM, 3,300mAh battery, and 16GB of internal storage expandable up to 128GB. 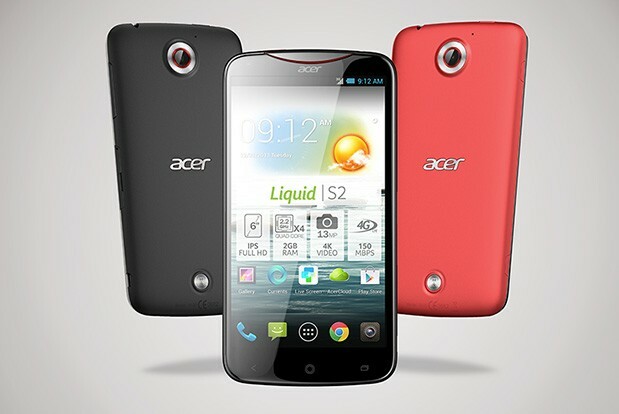 No information has been given with regards to the pricing, Acer only mentioned on its press release that the Liquid S2 will be available by the end of October.